Pioneer rap group Run-D.M.C. was formed in the Hollis section of Queens, New York in the early 1980s. Rappers Run (born Joseph Simmons on November 14, 1964), D.M.C. (born Darryl McDaniels on May 31, 1964), and DJ Jam Master Jay (born Jason Mizell on October 30, 1965), created the first rap group to achieve both critical and mass success in the emerging genre of rap music. Aided by Run’s brother, Russell Simmons, founder of Def Jam Records, Run D.M.C.’s career began in 1983 with the single “It’s Like That.” The moderately successful single opened the door for more singles and the self-titled debut album in 1984. The first Run-D.M.C. album featured the song “Hard Times” which discussed the rising poverty in the inner cities and the poor political and social climate in Queens during the early eighties, while “Sucker M.C.’s” encouraged black education among youth often prone to drop out of school. Rapper D.M.C. spoke of his own schooling in the now legendary line “I’m DMC in the place to be, I go to St. John’s University/And since kindergarten I acquired the knowledge/And after 12th grade I went straight to college.” Jam Master Jay’s beats as well as production by Russell Simmons on that album also moved hip hop away from the danceable disco-influenced funk sounds made by early rap DJ’s. 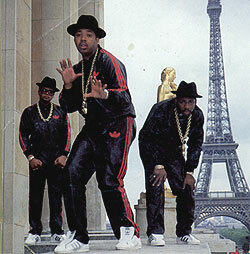 Run-D.M.C.’s music was sparse and raw, relying heavily upon drum machines. They also sampled rock music which increased its audience appeal. Run-D.M.C. was the first hip hop group to find mainstream success outside of rap communities. Their third album “Raising Hell,” released in 1986, would become the first rap album to achieve platinum status (selling 1,000,000 copies). The top selling single on the album was a collaboration with rock band Aerosmith to cover its 1970s hit, “Walk This Way.” The single became Run-D.M.C.’s best-selling song and revitalized Aerosmith’s career. The crossover success of “Walk This Way” demonstrated the growing influence of rap music on mainstream pop music. Run-D.M.C. continued to break barriers and helped rap music become accepted by mainstream communities. In 1986 they became the first rap group to be nominated for a Grammy Award for “Raising Hell.” Run-D.M.C. also was the first rap group to strike an endorsement with a major corporation when they inked a deal with Adidas in 1986. On October 30, 2002, Jam Master Jay, the legendary DJ for Run-D.M.C. was shot dead at his studio in Jamaica, Queens. Near the studio a sign appeared that read “Another brother lost to violence.” Even if Run-D.M.C.’s music was mostly positive, they were unable to save one of their own from violence. Stacy Gueraseva, Def Jam, Inc. (New York: One World, 2005); Ronin Ro, Raising Hel. (New York: Amistad, 2005).